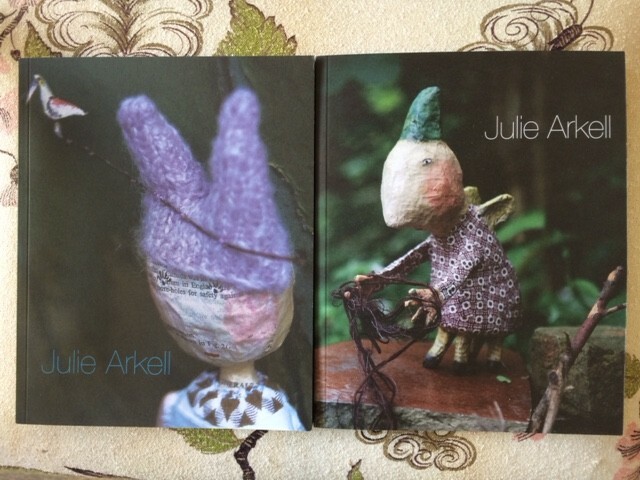 Whimsical, thoughtful and charming, Julie Arkell’s work gives us a moment to reflect on the magic of making. After the success of her exhibition ‘Away’ at Ruthin Craft Centre last year, we’ve just had whole flock of Julie’s creatures come to visit. 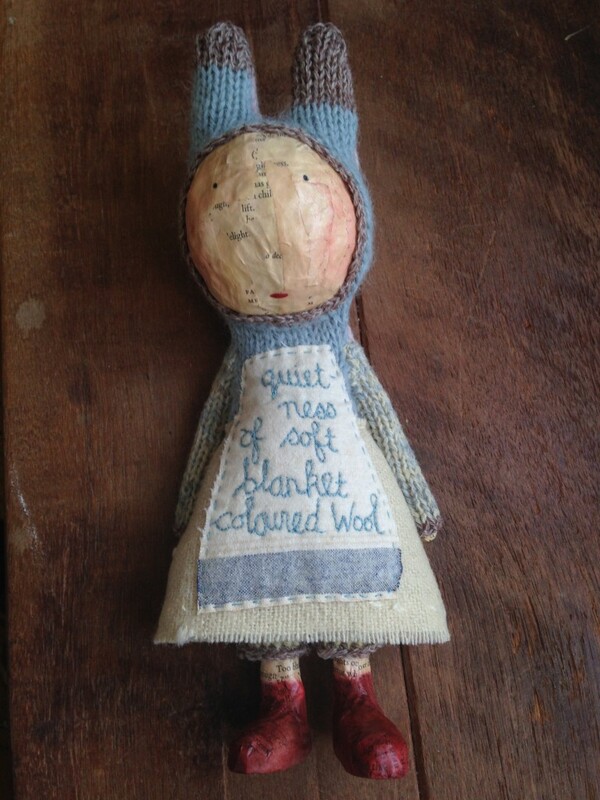 Carefully handmade from papier mâché with homely knitted outfits and embroidered details, each has their own personality and story. 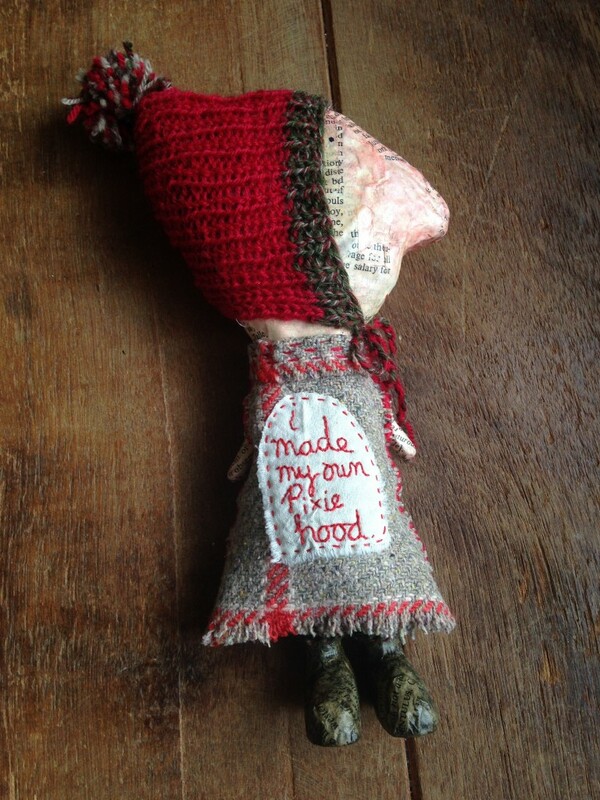 Words and phrases inspire Julie to create her figures, and snatches of a narrative are captured in her embroidered handwriting on aprons and outfits. Loop has been hosting Julie’s workshops since we were in our original shop in Cross Street almost 10 years ago. In these classes, students start with an unadorned papier mâché character and Julie shares her inspiration and her methods to make ears, hats, pinnys, skirts, trousers, scarves and flowers. Always popular, we currently only have two spaces left on her 11th October workshop. Please give the shop a call if you’d like to book. To accompany Julie’s recent exhibition we have the book ‘Away‘, a monograph allowing a little window into her creative process and artistic outcomes. The perfect partner to ‘Home‘, which again was released in conjunction with her exhibition of the same name. 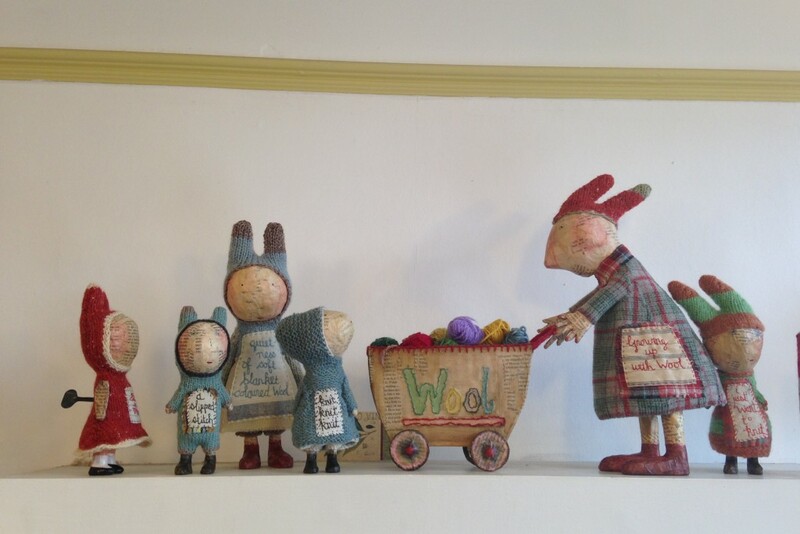 Speaking of inspirational wool folk, don’t forget Stephen West is visiting Loop this weekend! Some of you were lucky enough to grab a place on his now sold out classes- but if you didn’t why not pop down this Sunday 10th May for the fabulous trunk show? 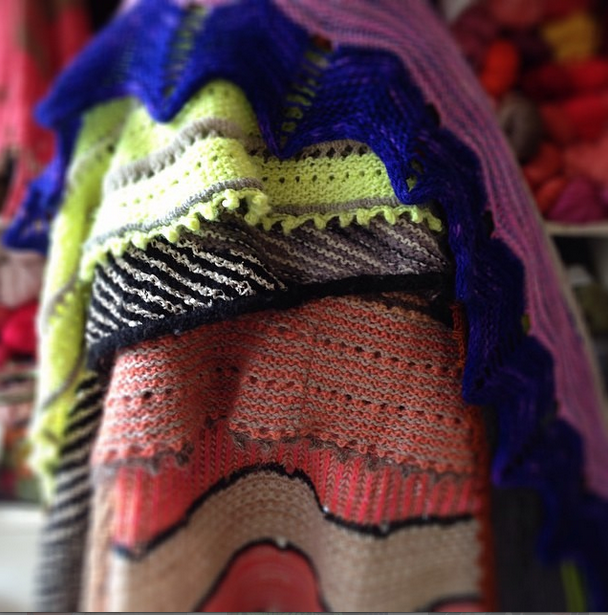 Including samples from his Besties KAL using Brooklyn Tweed, Stephen will be signing books and showing off shawls from 4pm- 5pm. See you there! ‹ Quince & Co Sparrow – Lovely Linen! Julie is a truly inspirational and amazing artist. I work from my studio in Ruthin and was lucky enough to take part in her 3 day workshop here at the Craft Centre last autumn. I follow you on IG and came across to your blog to read about Julie Arkell. I have a shop in country Victoria, Australia called Playing in the Attic and was wondering if you were able to offer me Julie’s two books at wholesale prices? We do not sell books wholesale I’m afraid. I love the quirkiness of Julie’s little works of art. 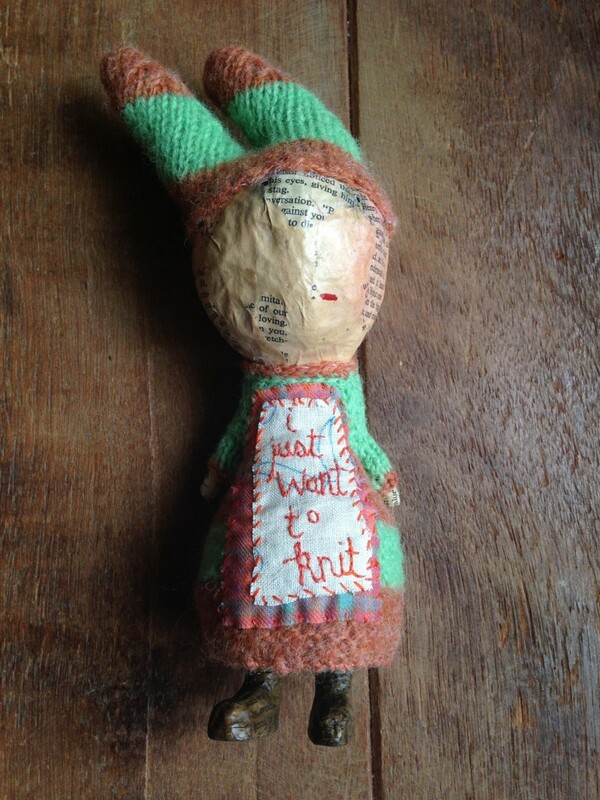 “I just want to knit” is my catchcry at the moment – With my left arm in a cast for several weeks my favourite pastime is impossible! I have to find something craft-related(other than reading my favourite craft blogs which I can do)that I can manage singlehanded.